Evacuate Immediately: When a house reeks of gas, the top concern is the safety of its residents. Gas is extremely flammable and causes breathing difficulties. Considering that it's also invisible and that it’s hard to tell the extent of leak, even the smallest misstep can result in a fire. If gas has leaked into your house, guarantee safety for yourself and the other occupants by evacuating immediately. Call for Professional Help: If you have a gas leakage issue, get in touch with your local fire department or gas suppliers right away. With their specialized equipment, they can help locate the leak site completely free of charge. Once the leak is found, the licensed gas line repairmen at Pride Plumbing of Rochester will perform the required repairs and replacements. 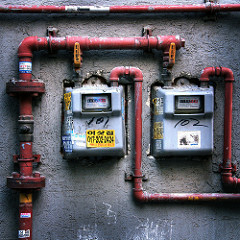 Based on their extensive knowledge in the area, they will follow all the prescribed codes to ensure that your gas connections are functioning properly. Avoid Naked Flames & Electrical Appliances: Be sure not to light a match, stove, or cigarette inside the house if you suspect that you have a gas leak. In addition to that, Rochester’s leading plumbers also warn against turning on any electrical appliances. The currents from switches and appliances make your house vulnerable to fire when there is a gas leak. It's best to allow the gas that has accumulated inside the house to escape by opening your doors and windows. In case of a gas leak, these suggestions from the plumbers of Pride Plumbing of Rochester are sure to keep you safe and sound. Anytime you smell gas on your property, don’t hesitate to call (585) 272-7272 and get in touch with their staff, who are standing by 24 hours a day, seven days a week. Their website provides further details about their gas pipe repair and tankless water heater installation services.